A galaxy like our own Milky Way is a wondrously thin disk of stars, planets, and gas clouds orbiting a super massive black hole. I would venture to say it is one of the most fundamental shapes in the universe as a majority of all visible mass is held together in one of these magical space-plates. I know, I know, “space-plates” might sound peculiar, but that is what they would look like if you could hold one in your hands: a very wide and complicated disk that is very, very thin. And, of course, it would need to be solid for that to happen, but just go with me here. The Milky Way galaxy is a mindboggling 100,000 light years across. To put it into perspective: that is approximately 587.85 quadrillion miles or more easily the distance from your house to your grandmother’s house multiplied by a quattuorvigintillion. Believe it or not, this is a real number; it might not be an accurate one, but it’s real. And it’s big. Given its extremely large diameter, the Milky Way is a comparative razor-thin 1,000 light years. If we were the same distance away from the center as we are now but looking at it head-on instead of from the side, it would fill up the entire night sky instead of being the thin band of light stretching to the horizons that we appear to see. So why do I remind you of the sheer enormity and comparative thinness of the Milky Way? So that your mind is nice and loose when I show you this….BAM! That is the Piaget Altiplano 900P, 3.65 millimeters (around 1/8th of an inch) of the world’s thinnest hand-wound mechanical watch, and my personal choice for the “Galaxy on the Wrist” award that I just made up. Mark my words, it’s gonna be a thing. Regardless of the reality of said award, this watch is something that made me feel very happy when I first saw it, and continues to make me happy the more I learn about its construction and innovation. Normally I like to talk about clever mechanisms, outrageous complications, or the extreme visual depth that some movements provide. Heck, my last two pieces covered all of those topics. But I must admit that I fail to give adequate praise to the simplicity and ingenuity that ultra-thin movements, such as those made by Piaget, display in their scant few millimeters of thickness. Nearly every caliber made by Piaget is relatively thin, and 23 out of their 35 in-house movements are categorized by the brand as “ultra-thin.” But this new caliber takes the cake, and it must have been a rice cake because the 900P shows no signs of heft around the middle. 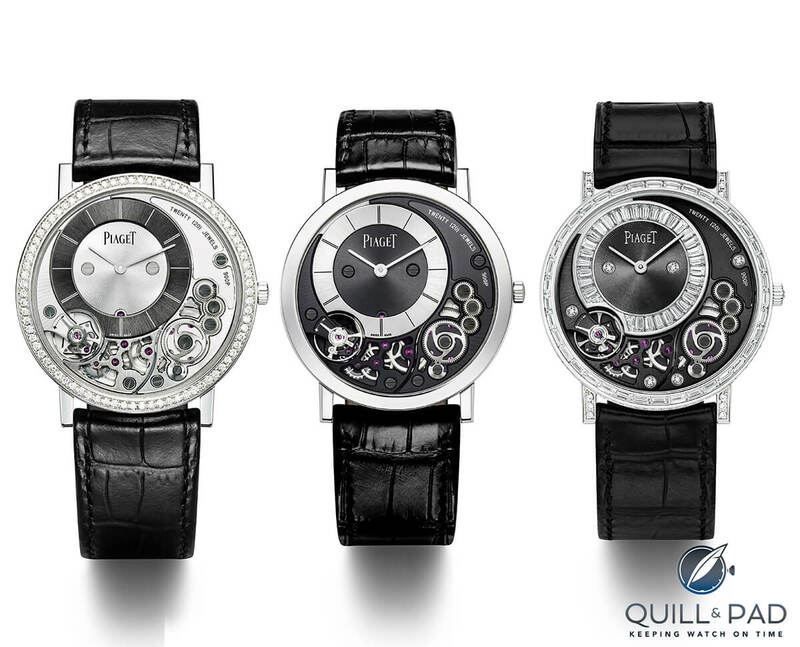 There are quite a few challenges that must be taken into consideration when designing ultra-thin movements, and Piaget has done a tremendous job of mastering these in the past. With the 900P, the company has gone as far as eliminating some of those challenges by sidestepping problems in the first place. The first is the case back. Or should I say main plate, or maybe the “case plate.” No, how about the “mainblate”? Oh, I’ve got it: if you smoosh the words together and do some clever cut and paste, you get something fun that from here on out shall be called the MacAinplack. The MacAinplack: all the features of a main plate, but doubles as a case back; new from Piaget. All kidding aside (not really, just for a moment) the 900P has an astoundingly clever base plate that eliminates the need for a separate case back by combining the two. With any standard watch, the case is made to house the already completed movement. Sometimes the case design and construction depend on the geometry of the movement, but a lot of times they are somewhat interchangeable. Not even remotely so with the 900P. To reduce thickness past the points already achieved, Piaget needed to depart from tradition – and the case back as well. As the case back is really an extra layer simply covering (and protecting) the movement, Piaget decided to integrate the two, making them one single, very thin piece. Acting as the base for the entire rest of the movement, the MacAinplack is where the balance, bridges, dial, and even some wheels are mounted. This is truly an innovative engineering choice, and one that I admire in terms of thinking outside the norm. For years it has been standard practice to simply make parts thinner and use tighter tolerances, squeezing them ever closer together, but to actually reconsider the fundamental aspects of how movements are made and assembled is a big departure. At least for mechanical watches. Earlier in horological history, some (or many) might remember the Delirium watch produced by ETA that utilized this same feat but for a quartz movement. Battling the Japanese firm Seiko to make the thinnest watch, ETA developed a movement integrated into the case back that eliminated the base plate, thus setting the stage for the Altiplano 900P years later. The idea was so successful that, after four further versions were created, it eventually led to becoming the basis for Swatch watches, which launched in 1983. The brand-new Sistem51 also similarly goes down this road, though Piaget takes the crown as the king of mechanical thinness. This leads to another major aspect of the thinness, a suspended mainspring barrel. Since the MacAinplack is so thin, in some areas without room for bushings, bearings, or jewels, the mainspring barrel did not have enough room to be mounted with pivots on the top and bottom. So Piaget did away with the bottom pivot, redesigned the top pivot, and turned a simple mainspring barrel into a suspended wheel hub. That description is certainly a simplification, but so is the entire solution. Piaget realized that it could provide adequate support for the barrel without needing the bottom pivot and its corresponding pivot hole. There is no room for it anyway. This allows the MacAinplack to remain as thin as can be without the bother of hosting a pivot hole for some silly thing like a mainspring barrel. How needy those barrels can get. That interesting solution pales in comparison, however, to the other main innovation, which, to some, might not even seem like an innovation at all: a dial on the same level as some of the wheels of the main gear train. Looking at it from above, this might not look like a big deal. The off-center dial is slightly recessed, which is not necessarily new, but the details of that recess are anything but typical. Due to the extreme thinness required, the dial and hands do not protrude above the top of the bridges. Design-wise this helps keep things svelte, but it was really an essential aspect because of what happens to thin cases. 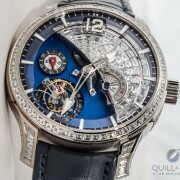 Similar to being underwater or wearing a strap too tightly, when pressure is applied to thin cases they can distort, causing the crystal to be squeezed closer to the dial. If the hands are protruding above said dial, the crystal can actually touch the tops of them and bring them grinding to a halt. Recessing the dial gives them a little extra room, but in this super-thin instance, it actually moves the dial and hands below the surface of the surrounding bridges, providing a “crunch” cage that protects the movement from being squeezed to a stop should someone happen to cross their arms or get sat on by a linebacker. The crystal will simply push on the sturdy bridges while the movement keeps ticking away. This feature is so groundbreaking that the mechanism allowing the recessed hands to sit below the tops of the bridges is actually covered in a pending patent. My Google search for said patent has not revealed anything yet, but I am very curious to know what fundamental changes have been made since it could kick off a whole new chapter in ultra-thin movements. I guess I will just have to bide my time patiently for that scrumptious technical detail to be released. Overall, the Piaget Altiplano 900P is a beautiful addition to the Piaget line of amazingly engineered wafer movements, and I look forward to many more years of the brand’s ultra-thin mechanical marvels. Don’t tell my heart, my achy, breaky…break…breakdown. OH YEAH! I almost forgot. • Wowza Factor * 6.8 Picking it up and feeling the lack of thickness while looking at that mechanical dial can make anybody exclaim out loud. • Late Night Lust Appeal * 45 gn » 441.299 m/s2 Just under the max sustained force for a human on a rocket sled, the Altiplano 900P can make you feel like you are jetting across the desert floor just to get your hands on this watch. • M.G.R. * 61.4 An extremely solid outing for a movement that does nothing but tell the time without even a second hand. It’s not in what you do, but how you do it. • Added-Functionitis * N/A The 900P is a simple two-handed, classic dress watch. Being the thinnest hand-wound mechanical in the world doesn’t change that which means no swelling and no need for a tube of Gotta-HAVE-That cream anytime soon. But I still want it. • Ouch Outline * 8.12 – Putting out 30 Candles with your Fingertips I’ve tried it a couple times, the first one is ok, the second one turns annoying. Doing it 30 times would be no picnic, and yet to get an Altiplano 900P, bring ’em on! • Mermaid Moment * 10 Seconds on the Wrist Forgetting it’s There What more can be said about such an amazing ultra-thin movement when it comes to falling in love. Forgetting it’s even there is the ultimate desire when looking at such a piece. • Awesome Total * 391.57 The 900 in 900P divided by the thickness in mm: 3.65. Add to that the number of components in that unbelievable thickness, 145, and you reach the awesome total for the suitably awesome Altiplano 900P. For more information on Piaget’s timepieces, please visit www.piaget.com.